The Volkswagen Group is now carrying out advanced testing at Hamburg airport of a self-parking system for its VW, Porsche and Audi vehicle ranges that could be available as soon as 2020. It's obviously an important step on the road to fully autonomous vehicles, but this element of autonomy is likely to be available to buy a long time before fully driverless models become available. No matter how people feel about the prospect of driverless vehicles in general, and whether or not they want to continue to drive themselves because they enjoy it, most people will probably still like the idea of a car that parks itself. And we're not talking here about one of those systems where at the push of a button the car can take control of the wheel and navigate into a space you're alongside of when you're sitting in it. This is a system where you leave the vehicle to go and find a space on its own and park in it. Volkswagen Group's Chief Digital Officer, Johann Jungwirth, says of the system: "Autonomous parking can make an important contribution to creating convenient, stress-free mobility for our customers. We therefore want to democratize the technology and make it accessible to as many people as possible." This unique technology being tested in Hamburg is based on a car park map that the Volkswagen, Audi and Porsche vehicles use to navigate their way to a parking space all on their own. Navigation is facilitated with the help of simple pictorial markers that have been installed in the multi-storey car park. The big advantage of this system is this it can effectively be used in any car park, and is expected to become available for the first customers in selected multi-storey parking lots from the start of the next decade. 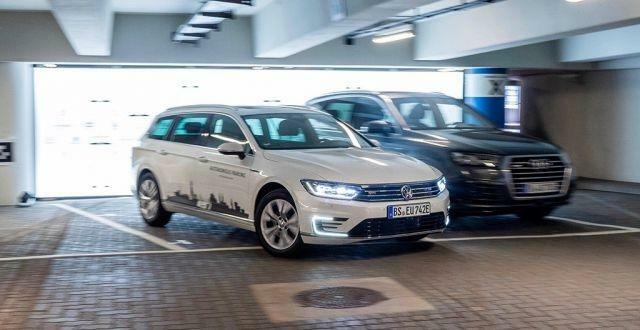 VW's autonomous parking system is now being demonstrated publicly for the first time in Hamburg, having now got to the point where it has left the research lab and is at an advanced stage of its development. At the moment the testing is being restricted to selected multi-storey parking lot in an exclusive traffic flow, i.e., in separate areas of the car park where people don't have general access. Once enough testing of that type has been completed, the developers will move onwards to testing in mixed traffic environments. The eventual goal is for the system to be able to park autonomously in all parking lots including public ones such as those outside supermarkets.